Seated before the gorgeous flowers and sparkling crystal of Atrio’s table, I take a photo of the unusual first course and look for a place to set my big camera down. With a quiet swoosh and a whispered “Here’s a small stool for your camera”�, an efficient and gracious waitperson ratchets up the already high level of service. This is not just two Michelin star service, this is Relais Ch�teaux service - and I’m thrilled to be here! Here is the Spanish town of C�ceres, in Extremadura, which is called the pantry of Spain. It is a UNESCO recognized town with a walled historic district that is so well preserved, The Game of Thrones filmed its final season here. 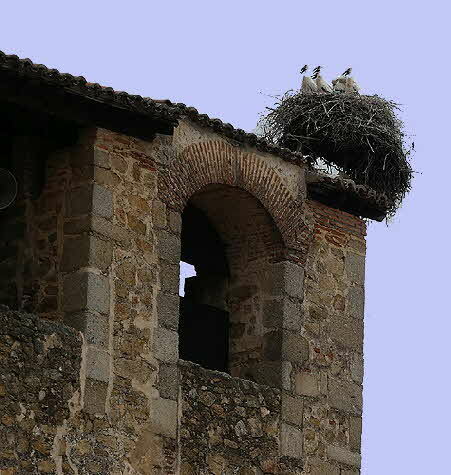 It is dotted with castles, palaces, and 30 Islamic period towers in a blend of Roman, Moorish, Gothic and Italian Renaissance styles, most sporting a stork’s nest “cachucha”�� or cap, (the storks are protected). Most importantly, this is the home of Chef To�o P�rez, of Atrio Restaurante. 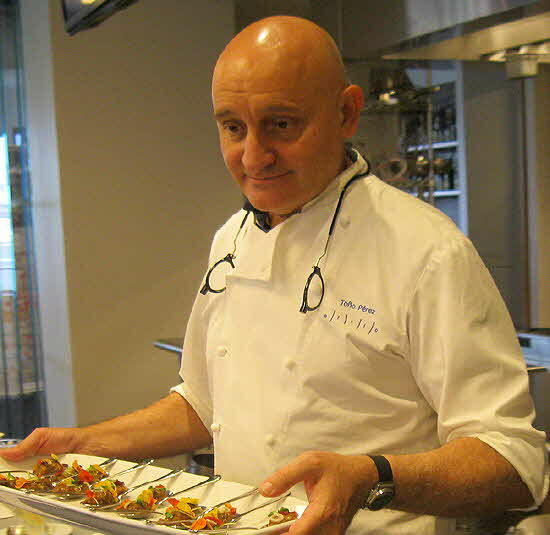 Chef T�o is animated and dapper, with a shaved head and a whimsical grin, forever looking like a man full of mischief. Twice named by El Mundo newspaper as one of Spain’s most influential homosexuals, To�o and his partner of 38 years, Jos� Polo, preside over the perfection that is Atrio. When I visited, Chef To�o was in his kitchen overlooking his personal garden, definitely a man surveying his domain. Atrio could be anywhere in the world, but Chef To�o wanted it in C�ceres, in the Plaza de San Mateo, near his friends and family, with all the ingredients Extremadura is famous for at his doorstep. When seen from the outside, the building appears to be as old as the ancient structures surrounding it. That is an illusion. 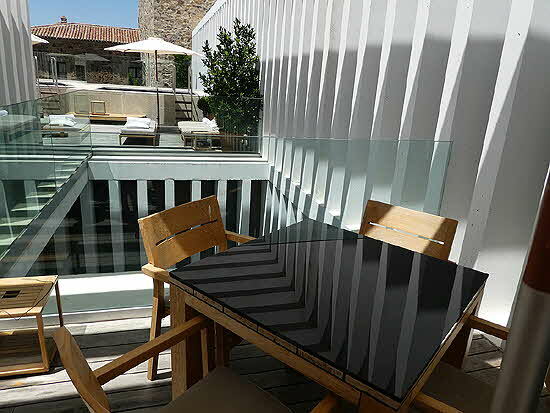 Everything is brand new and ultra modern on the inside, where the award-winning architect team of ��lvarez & Mansilla proved their mastership of modern design. Atrio is a trifecta of luxurious perfection. It’s a Relais & Ch�teaux Hotel, meaning the finest of the finest, with 14 rooms and suites on the top floor. They are above the most impressive restaurant, which, according to Wine Spectator magazine, sits on top of the best wine cellar in the world. Jos� Polo is the collector who put this most magnificent wine list together. He has verticals (meaning many vintages from individual wine producers) of all the important vintners -- such as Petrus, Haut-Brion, Lafite-Rothschild and Ch�teau d’Yquem -- along with the finest vintages of smaller houses - many of which are almost impossible to find. These are all beautifully presented as works of art in a circular hand-crafted wooden showcase. Descending the stairs with alternating black and white treads and risers creates the illusion of floating down to the round perfection of the cellar. But this is not a staid museum. No, these bottles are all for sale. The wine list, with images by Montserrat Soto, is worthy of the best coffee table book. Jos� Polo is a collector who can part with one of his “children”�� and rejoice in your enjoyment of it. 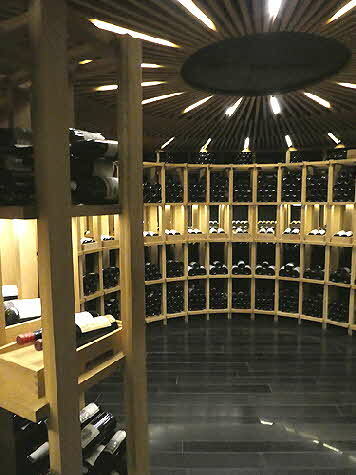 His is a wine cellar that knows no equal. 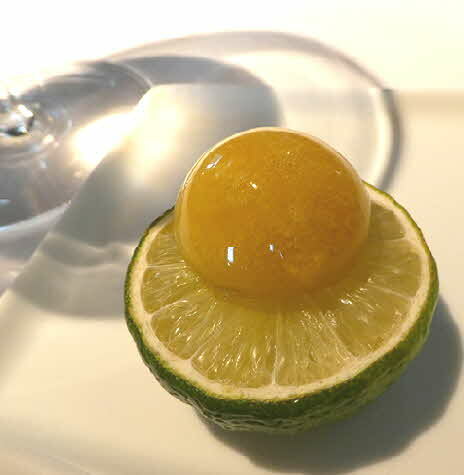 At the exquisitely appointed tables of Atrio, Chef To�o serves a tasting menu only. We had 12 courses, each intricately constructed and presented, and all as beautiful as they were delicious. 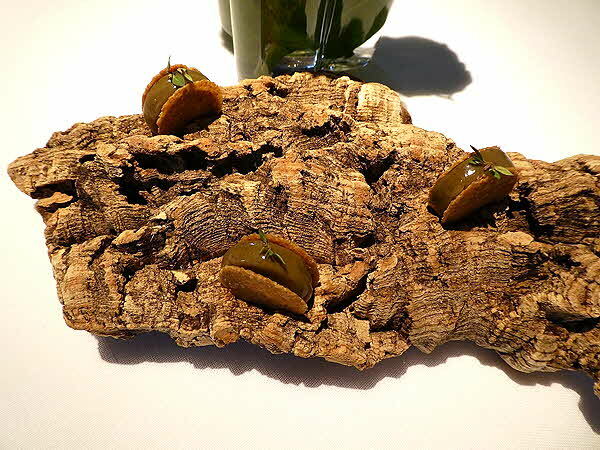 The most unusual presentation was a potato and chorizo cheese on crackers that looked like a growth on a piece of cork bark -- a very earthy look for a very earthy taste. 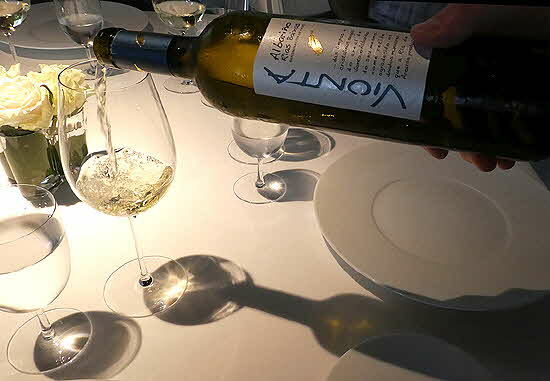 That was served with that slight effervescence of an Albarino wine, Vionta, that always makes me smile. It was the perfect beginning to the meal. There was an ice bowl of grouper ceviche served with a scoop of tomato and green onion ice cream on a half lime beside it. As instructed, I ate the dollop on the lime first. It was so strange �“ looking like, but not at all tasting like a dessert, then squeezed the lime on the ceviche and devoured it. It worked as a concept and as a taste... plus it was fun! 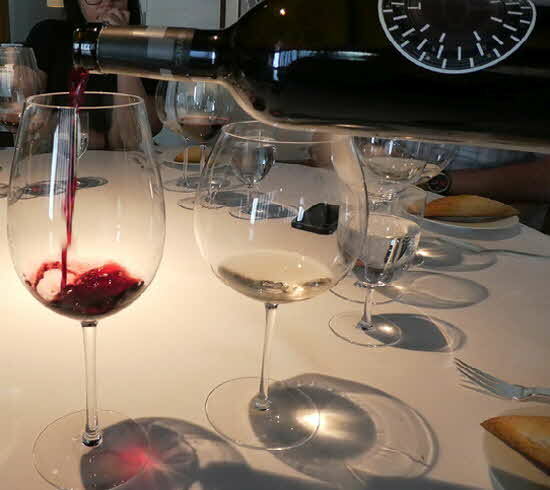 It came paired with a blanco de tinta wine, Man�, a white wine made from dark grapes. Its fresh citrusy taste did not overpower the fish. Another fish course was the complete opposite in taste and pairing, with a twist. 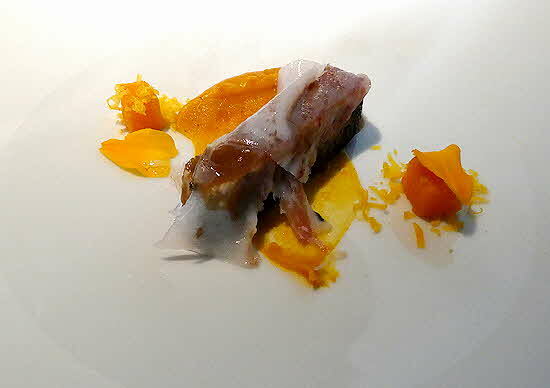 It was a strip of rare tuna on a smear of sweet potato paste, topped with small pieces of jamon de bellota fat which immediately melted to give this beautiful looking tuna a first taste similar to ham, before dissolving into tuna. It took three people to serve: one to place the plate, one to pour a tiny dab of sauce on the tuna and one to use tweezers to place tiny strips of ham fat on the tuna. It was an extravagant presentation, fascinating to watch, and delicious. The red wine served with it, Carabal C�vea, brought its full, rich mouth-feel to complement the potent flavors of this dish. The award for most instagrammable dish was a tie. 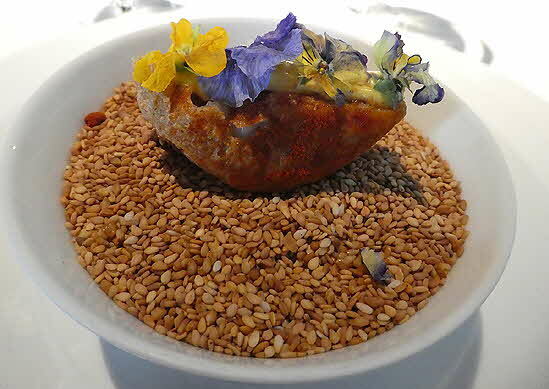 The first was an intense combination of orange/carrot/ginger flavors in a sea anemone, topped with violets. 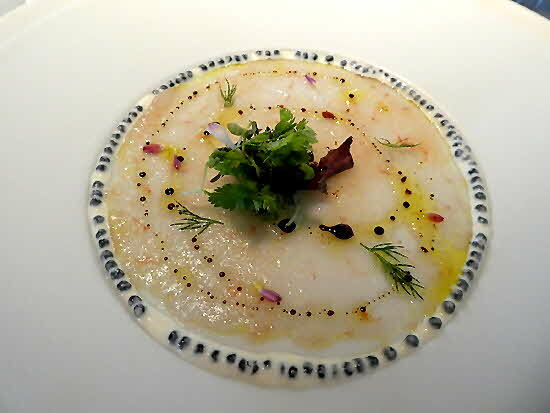 The other was the essence of shrimp in paper thin slices encircled by smoked caviar.� Either could be hanging in an art gallery, but I preferred to eat them. Finally, after many more courses, we retired to the fragrant garden for dessert. Joining us, Chef To�o said he designed the garden himself and is in it almost more than his kitchen. Adding, “If I changed careers I would become a gardener”.�� And, while the garden was a lovely place to enjoy dessert, I had to admit that after eating his fabulous food, I hope he remains a chef.